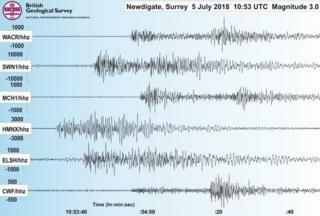 A seventh earthquake in just over 12 weeks has struck in Surrey in what has been described as a "swarm" of tremors. Robin Miller, in Newdigate, said: "The whole place shook. It felt like someone had reversed a vehicle into the building." "With this cluster or swarm, at the moment we put it down to natural seismicity. We live on a dynamic planet," Mr Galloway said. "Plates move about all the time. They're bashing and moving away from each other." An OGA spokesman said: "No flow testing operations are currently taking place at the Horse Hill drilling site." A spokesman for Angus Energy said: "Angus Energy does not frack nor is there any drilling at Brockham. In fact, there is no fracking in all of Surrey. These fields have been in production for decades, nothing has changed. "There is absolutely no correlation between the reported tremors and our activities. The British Geological Survey reported the tremors were over seven times deeper and over 11km away from Brockham. Based on the regional geology it would be physically impossible to create these tremors from the Brockham Oil Field. Any contradictory claims are unsupported by the facts or data." Frack Free Sussex spokeswoman Lorraine Inglis said: "It's not just UKOG at Horse Hill, it's also Angus Energy at Brockham." She said: "We have not had any earthquakes in Surrey or Sussex for 500 years. "Now we have onshore drilling and we are starting to have earth tremors. "This one today is higher than the one in Lancashire which led to a moratorium on fracking. "We want a moratorium on onshore drilling in the Weald." Spokeswoman Brenda Pollack said: "Worryingly, it seems that the authorities can't yet say what has caused these [tremors]. "It's right that a thorough investigation now happens so that people know whether or not it is related to local oil activities." UKOG's executive chairman, Stephen Sanderson, said there had been no subsurface activity at Horse Hill since March 2016. He said: "We are currently preparing to conduct a flow test using a crane. No flow has yet taken place. We are not drilling and operations utilise a crane not a drill rig. "We should stress that the work we are planning has the same seismic impact as any type of construction work requiring the use of such a crane." Mr Sanderson added: "We would also like to point out that there was no recorded seismicity associated with our 2014 drilling and 2016 flow testing, nor are we aware that any of the other 80 plus wells drilled or flowed in the Weald are associated with any seismicity. "Furthermore as the BGS have stated, the source of this seismicity is related to a deep-seated basement fault at around 5.5km below surface, 4.5km deeper than our activities at Horse Hill."